Are all your staff confident in communicating with Deaf customers? How can you make your services accessible to Deaf people? Whatever your organisation – Government department, sports centre, local council….. We can provide a workplace training session to meet your needs. Under The Equality Act 2010, all authorities and public, private, or voluntary organisations carrying out public functions on behalf of a public authority; have the additional responsibility of ‘positive action.’ The aim is not only to eliminate discrimination towards Deaf people, but to exceed standards regarding equality and access. Awareness of Deaf issues, culture and British Sign Language. Practical steps every employee can take to actively promote engagement with BSL users, and ensure accessibility. A ‘hands on’ session learning BSL signs relevant to your organisation. We can provide training at your place of work at a time which suits you. 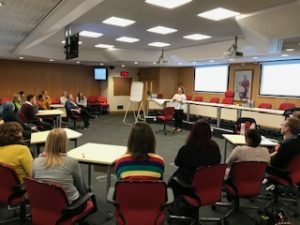 Hart District Council in Fleet proved they are committed to making services more accessible to Deaf BSL users by booking a full day of training for their staff. “Thanks to Kathleen, Paul and Debbie for delivering such an engaging course for us. I feel like I learnt so much during such a short space of time and I look forward to practising and improving.” Liz Glenn, Health & Policy Project Officer. 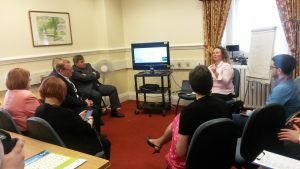 As part of Deaf Awareness Week Dot Sign language was chosen to teach Deaf awareness and BSL to a cross-party group of MPs in Parliament. We were delighted to do this. It sends such an important message when the leaders of the country recognise the importance of learning BSL. 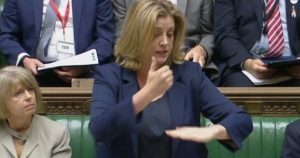 Kathleen taught Secretary of State Penny Mordaunt BSL so she could announce the Global Disability Summit in sign language in Parliament! When providing a public service, it is vital to have ‘Go to’ people who hold a Level 1 qualification in BSL. This will enable you to put the certificates on the wall so all your customers know who the staff members are. The Level 1 course can be achieved in 60 hours of teaching. Find out more about level 1 training.